Do you not read like I read? My character was born and raised female. What's this about cross-dressers? Chelsea woke up and started down the stairs of her house in New Bark Town. Downstairs, her mother lay across the couch reading a magazine. Chelsea lightly lay her travel knapsack on the center table and keeled besider her mom. "Are you sure it's okay that I go?" she said hesitantly. Her mom looked at her and smiled playfully. "Of course! I've been holding you back for long enough. Go have that adventure you should have had 5 years ago." Chelsea's mom kissed her forehead and they hugged. Chelsea stood up, swallowed a huge breath of air, and stepped outside to start her journey. "I'm bored." Callie lays on her back staring out the window to her room. It was still fairly early but the chores around the ranch were already complete for the day. She turns over and glances over at her new chickorita, Marilyn. Her aunt had given the young pokemon to her a few weeks ago, stating that it was about time she had a pokemon of her own. "Chi-ka." Marilyn replies, tossing her head so her leaf was behind her head. "So you want to get outta here too, Marilyn?" Callie asks, receiving a nod from the grass pokemon, "We could go to Olivine. There's a gym and some trainers there. Sound like fun?" Marilyn shrugs slightly at the suggestion in a 'might be fun' sort of way, not seeming particularly enthusiastic but not refusing the idea. "Kay, we can try it." Callie nods, "It'll beat sitting around here with nothing to do." she smiles, jumping down from the bed and trotting out into the hallway. She grabs her bag from the banister as she runs down the stairs. Her aunt was sitting at the table as trainer and pokemon pass by on their way to the front door, "Goin' out?" she asks, glancing up from the papers she'd been reading. "Yep! We're going to Olivine." Callie replies, "Probably won't be back for a while." Her aunt smiles and nods, "You be careful out there on the road, Cal." "I will! See you later, Auntie." she waves, running out the door to the small ranch house with her chikorita following as best she could. Charlie lay down in the sand, looking up into the deep blue sky. He breathed in the fresh sea air, and sighed. He checked his watch. Still another half an hour to go. Then he could finally get off this island and explore the world! He looked to his right, where his Totodile, Aqua, was having a snooze. His father had given him Aqua for his twelfth birthday, and the two were hardly ever seen apart. He reached inside his pocket, where he kept the ticket he'd been given a day or so ago. He knew if he lost it, he could be on the island for another month or two before he could have another chance to leave. Ferries between Cianwood and Olivine were few and far between, expensive too. Suddenly, he heard the sound of a horn. It sounded far off, but it didn't stop Charlie from getting excited. He ran into the shallows, and placing his hand on his forehead, scanned the horizon. A few metres behind him, Aqua was woken by Charlie's sudden rush. "It's the ferry Aqua, the ferry!" Charlie was pointing towards the distance, jumping up and down excitedly. Chelsea stepped out of her house in a rush. Prof. Elm's lab was just across the way, and that was where she would get her first pokemon. She rushed there and glanced inside the lab. Prof. Elm was leaning against his desk with really magnifying glasses on. He looked up and all Chelsea saw were his eyes, big and wide. "Oh hello, Chelsea. Come for your first pokemon?" Chelsea approached him and nodded. "Yessir. I think I know who I'm choosing too..." Chelsea walked to the table where the pokeballs were laying. Prof. Elm walked right behind her and looked at the pokeballs. "So... which will it be?" Chelsea thought for a moment, though already knowing her choice.. she wanted to make sure she was making the best decision. "That one" She picked up the pokeball that had a small little lightning bolt on it. Rather than the other pokeballs with leaves, or flames or water droplets. She clicked the little botton and Elm smiled as a red light flashed from the ball and suddenly, a small Pichu stood in-front of her. Chelsea smiled. "Would you like to name the Pichu?" Elm asked Chelsea. She looked at the Pichu and it looked up at her happily. "I'm gunna call her Ganny" she said equally happily. Gold and his explotaro,Cyndaquil,are anxiously packing their bag to set off on their journey. Gold looked on his explotaro and explotaro looked back on him there was a pause then they both jumped for joy. He rapidyl went down the stairs and made a sudden pause and look on his mom and said "Dont worry mom i will be back soon. I am gonna be the greatest!". Gold's mom looked on him with glossy eyes and said "Get them my boy Get them!". Gold then rushed off to his rival's Green House screaming to the sky "YAHOOO THE GREAT ME SAMA SHALL BEAT YOU ALL HEHE"
Callie wanders down the path that runs along the pastures, watching the miltank and mareep graze lazily under the watchful eye of her aunt's raichu. Marilyn catches up to Callie and follows the trainer's gaze out over the pasture. It would be a while until they'd be able to come back to the ranch if they started the gym circuit. This thought made Marilyn slightly sad since she'd been hatched here and raised alongside the mareep and other young pokemon. She looks up at Callie, now focused on the trail ahead of her instead of the pastures, "Chika?" she asks, sounding worried. "We'll come back and visit." Callie replies, "As soon as we can." Marilyn smiles softly, nodding to her trainer and turning her attention to the path as well. The pastures soon give way to forest, humming with the cries of various pokemon. The path that wound through it would lead to the outskirts of Olivine City after a several hour long walk. Marilyn steels herself for the battles they'd no doubt face during that time. Stepping in a bush, Alice looked a bit lost. She had no clue where to go, and she was on a rather important mission from Mr. Pokemon, heightening her anxiety. She looked around and saw nothing but trees and grass. Her Togepi, cuddled up in her arms, let out a small "Pi!" and remained idle as her owner panicked. "OHMIGAWD OHMIGAWD OHMIGAWD OHMIGAWD WHERE DO I GO?!" Her Togepi leaped from her arms and, despite her owner's pleas, headbutted a nearby tree; a sleeping Spearow came out from the bush. "EWWWWWWWWWWWWWWWW, WHAT IS THAT UGLY BIRD?!" Alice ran towards her Togepi, picked her up, and ran around the bird, to the Berry House, and then ran around to the other side of the wall and stopped, peering beyond the tree to see the Spearow. "Look at that ugly bird. Now, Pippy, I don't want you picking fights with other Pokemon, so don't do that!" Togepi only tried to get the tree knocked down, not noticing the Spearow. "I know you were only trying to help, but still! Be more cautious!" Alice told her only Pokemon, and it replied with an affirmative "Pi!". Alice checked her PokeGear. They appeared to be headed the right way, to Violet City. "Isn't this exciting, Pippy? We're headed to a nice city to deliver a package to a professor's assistant! It feels so important! And maybe we'll even get to visit that nice Sprout Tower I've read so much about~"
"That doesn't sound very enthusiastic. Oh well! I'll hold both our enthusiasms!" They arrived to Violet City minutes later, worn out. Alice opted to stay in the nearest Pokemon Center for a bit. Upon entering, Alice noticed a man in a lab coat by the counter; he introduced himself as Professor Oak's Aide and Alice handed the package to him. As he walked away, Alice waved, and then hopped into a sofa. Esther woke up from his little nap of sorts.He looked around. "Ahh Mahogany Town! "He said "The Best Place In The Pokemon Earth!" "._." Esther said with his face. Esther walked downstairs to meet his mom. Esther left with his Azurill a gift from Pryce the local gym leader. A Man leaped of a huge bunch of ice. You gonna become a Pokemon master?" "Are you going to rule the school?" Charlie was on the ferry. It was a long ride, because the Whirl Islands got in the way, making it very difficult to navigate. It was an overnight trip, and Charlie could hardly contain his excitement. His parents were waiting by the door when he had came clambering down the stairs with his bag, Aqua not far behind him. This meant he could not escape without saying goodbye. The ferry was motoring along slowly, and the deck was swaying slightly. Down near the dining room was a battle room, where two or three matches could be held at one time. Charlie and Aqua spent a lot of time down there, watching the trainers battling. 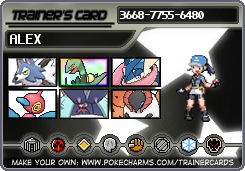 He didn't want to battle anyone, because Aqua was too low levelled. It was this moment that Charlie decided he would try and defeat the eight gyms and compete in the Pokémon League. He looked down at Aqua, who was already staring up at him in wonder. Charlie patted his head, and the two continued to watch the current battle. Gold went over to Green's house and found that was not there. Gold decide to got the tall grass and train his explotaro in the grass until green returns. Chelsea and Ganny left the lab and headed back home to tell her mom. At home, her mother sat on the couch still reading her magazine. "ohh a Pichu" she said with a grin. "Her name is Ganny, mom. like her?" Chelsea asked. Ganny jumped around Chelsea and explored the kitchen and then opened a drawer and took out a fork. Ganny turned to Chelsea and pointed at her with it. Chelsea rushed to Ganny, took the fork from her grip and picked her up. "No, Ganny, no. Forks are dangerous." Ganny continued to reach for the fork in a sad way. Chelsea's mom laughed. "She really is quite a character" Then she coughed. "Mom are you okay?" Chelsea ran to her mom and her mom looked up and pulled something from under the sofa. "Here's a Pokegear. I got it in the mail (she rolled her eyes) and thought you could make good use of it." Chelsea thanked her mom and then left the house to finally get out of New Bark Town. As Chelsea and Ganny walked up the first route, she spotted one of the kids from the town wandering around in the grass with a Cyndaquil. It was Gold. She ran up to him with Ganny in her arms and greeted him. "Hiya"
Keeps to himself, rather would go on his journy alone and learn everything himself without peoples help. He isnt a douche, he can be nice but he would rather be quiet. Grayson comes from a completely unknown region. His father abandoned him when he was 4, by the time he was 8 his mother passed away and it was only him and his older brother. When he was 11 his brother decided to pack up and go on his own journey. Grayson moved in with his best friend but had a troubled year at school and decided to run away. By the time he was 13 he was on a boat to Johto. Jason squirmed under his bedsheets, mumbling something about Cookies and Facebook. His eyes peaked open, and finally emerged to see the bright light of noon. He looked at his cell phone to find that it was 12:39 PM. He was supposedly to leave with Flint at 12:45. He jumped up and slipped a pair of jeans on, no need to shower. Flint stood in the doorway with his Staraptor. "Dang kid, bout' time you got out of bed. No champion stays in bed til' noon!" Jason glared at Flint with his bagged eyes. "Shut. Up." "No, No, No!" Flint shook his finger and winked. "What's the magic worddddd?". Jason grunted, as he was obviously pissed off by his brother. "...Please." Flint tossed his a PokeBall, and Jason instantly opened it. An elekid popped out, angered by his awakening aswell. ~Sorry for not making a long first post, or having 4/5 posts by now, but It takes me a while to get good ideas for RPing. The sky is bright without a cloud in sight, you hear the boats horn go off. You can see all the pokemon of Olivine town. The birds soaring in the sky the water pokemon jumping in and out of the water. Grayson is resting his head and arms on the railing waiting for the boat to reach dock. Grayson looks around to see all the pokemon and notices in the rocks a troubled pokemon. Grayson looks around to see no one noticing it and realises that the boat taking its time reaching the dock. Grayson then puts his cap backwards and dives into the water. He swims over to the rocks as people from the boat watch. He reaches the the scared little pokemon and realises its a squirtle. "It's going to be okay" said Grayson to the squirtle. The squirtle looks at Grayson and has confidence in him. But the little squirtle notices something and begins to panic. "Its okay calm down im trying to help you." said Grayson trying to calm the pokemon down. Squirlte then points and Grayson turns around to notice a Gyarados heading for their way. Esther got out of Pryce's house and was on his way to the city gates. The geezer threw a pokeball and his pidgey flew out "EY OL pidgay give him a lifty see"
Grayson gets the last rock off of squirtle and squirtle is free. But Gyarados hits Grayson into the water and he begins to sink to the bottom. Squirtle then dives into the water and picks up Grayson and swims to the top. Squirtle places him carefully on the rocks and begins to fight of Gyarados. Squirtle uses water gun but it has no effect. Gyarados then looks back at Squirtle in anger and uses dragon breath. Squirtle uses withdraw. Squirtle dives into the water and gives the Gyarados a rapid spin to the face. Gyarados begins to feel the pain but that only makes it stronger. Squirtle begins to panic and doesnt know what to do. Note: I am opening this up to anyone in Olivine City who would like to jump in and save the day. Feeling content, Alice arose from the chair and stretched. "Alright, Pippy, let's go to Sprout Tower!" she said and Togepi reacted with a short "Pi!". Walking toward the Sprout Tower, she noticed in the distance the hypnotic swaying of the tower and felt rather calm.